The Marple Skate Park project was one of 15 projects across the borough to have applied to Stockport Council for inclusion in bids for funding from Sports England; however, unfortunately, we learnt this week that our project was not amongst the four selected by the Council. Alternative funding options will now be explored. 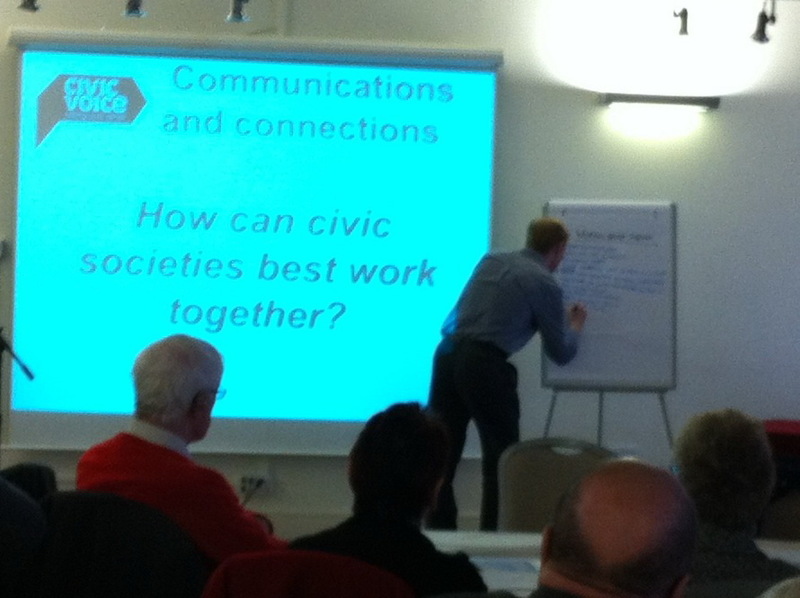 Civic Society members Gillian and Alan Postill headed off to Leeds this morning for a Civic Voice workshop meeting. Tony Burton, director of Civic Voice, lead the workshops and teased out what the Civic Voice members wanted for Civic Day 2012, and where the civic focus should be concentrated for the coming year. As usual, Civic Voice took a very bottom up approach encouraging all present to voice their views and noting all the suggestions that were put forward. Another inspirational Civic Voice meeting. Three members of the Civic Society, Gillian and Alan Postill and Arthur Proctor, attended the Civic Voice AGM 2011 in Sheffield where Gillian received a highly commended Marsh Award for work on the Vision for Marple. Following the first and very successful national Civic Day last year, Civic Voice has decided to make this an annual event. The aim of Civic Day is to raise awareness and promote civic pride. Two members of the civic society, who are members of the Civic Day organising group, met in Liverpool last week to discuss plans for this years Civic Day which will take place on the 23rd June 2012. We will be discussing this at the committee meeting on Tuesday of next week to decide on our project for Civic Day 2012. It would be good to if other groups, societies, schools etc were to join in and get involved. Two site meetings were arranged today with Paul Hartley, Conservation Manager from SMBC and Norman Redhead from the Manchester Archaeological Unit to discuss the possibilities for archaeological investigations at the Lime Kilns and the site of Marple Hall. Kerry Walmesley, Conservation Trainee SMBC and a representative from British Waterways also attended. ﻿It was agreed by all to pursue both projects with the aim of arranging community archaeological digs on both sites. Mark Whittaker (Friends of Marple Memorial Park), Lewis Abbot (local skateboard enthusiast, who was involved in development of existing skate park) and Graham Clarke (Marple Vision Partnership) met on Friday the 20th January with Richard Booker (Parks Development Officer) and Tim Boylan (Landscape Officer) to discuss the bids that have been submitted to the Parks Dept for the proposed skate park development. 5 contractors were invited to bid and 3 submitted offers. The bids were based on a design brief prepared by Richard and Lewis on the basis of comments made by Marple Hall students, consultation with park users and Lewis's contacts with the local skating community. Richard will now contact Kirsty Pierce (Marple Hall School) to arrange to speak to the students they met last time to show them the designs and get their views. A group of students considered the skate park project as part of the school's Enrichment Week last July and prepared a display that was on view at Marple Library for some time. A copy of the design brief and the Skate Park Survey can be found at: http://www.marplememorialpark.org.uk/projects/skate-park-improvements.html and there is also a Facebook page: http://www.facebook.com/marpleskatepark. Details of the bids will be added to these sites so that further comments can be made. The Speedwell Bus went out of service last night, Wed 18 Jan. This affects the 394 service (Glossop-Marple-Hawk Green-High Lane-Stepping Hill Hosp).TfGM have taken steps to get urgent replacements for Speedwell and they will, hopefully, be in place Fri 20 Jan. The 394 is a Derbyshire CC contract and there is some uncertainty over when they will have a new operator in place to run 394 and who that operator will be. 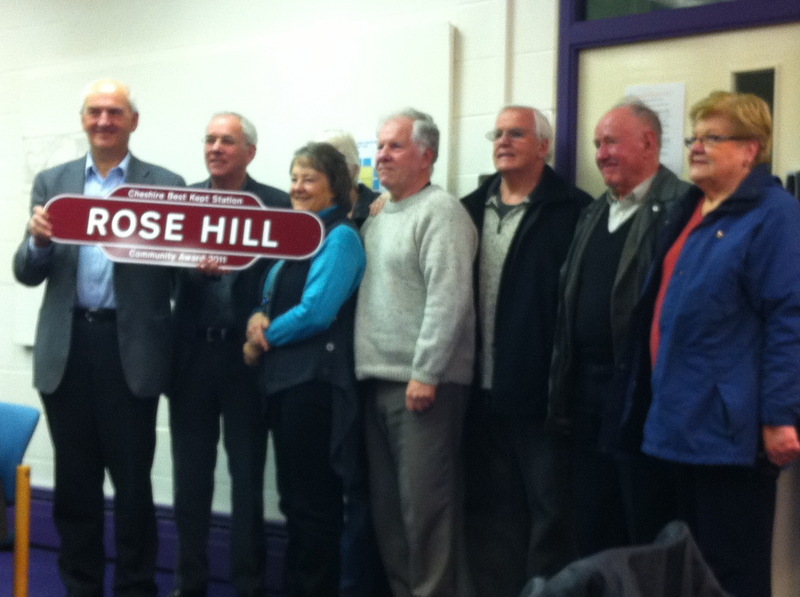 Congratulations to Friends of Rose Hill Station (FORHS) who won the 'Community Station 2011' award at the Cheshire Best Kept Stations Awards this week in Northwich. FORHS was set up three years ago to improve the usage of Rose Hill Station. They have succeeded in doing this by creating lovely flower beds and securing an extra train service. Well done and keep up the good work! Good meeting today with Maja from The Glass-House Community Led Design. Following a succesful application to Locality UK we have secured some free consultancy from The Glass-house to help us to develop plans for Marple Wharf. The idea is to arrange three meetings during February 2012 (one will be a site meeting at the Hollinworth Canal Project in Chesterfield) with members of the community, council officers and local councillors to develop plans and a model of Marple Wharf with a view to engaging an architect to help us to turn our Vision for the Wharf into reality.